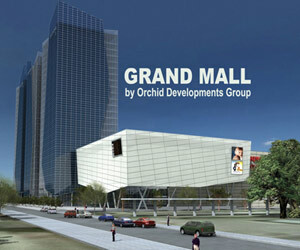 Grand Mall will be the biggest complex of a mixed type in Varna and one of the biggest in Bulgaria. Bulgarian real estate developer Orchid Developments said on Tuesday it received a permit to begin construction on its Grand Mall Varna complex in the country. The company said it was "pleased to announce it has been granted a construction permit for the Orchid MultiUse Complex, which includes the Grand Mall Varna, and has secured the financing required for the development," in a statement to the London Stock Exchange alternative investment market, where it is listed. Orchid said it would borrow roughly EUR 107 M from Hungarian banks OTP and MKB to finance the project. The loan is for a period of 20 years and is on a non-recourse basis. The 150 000 square meters mall will include 45 000 square meters of commercial space for lease, as well as 40 000 square meters of office space. It is expected to be completed by end-2009. Israeli firm Moore-Yasky-Sivan Architects (M-Y-S) carried out the architectural design and will oversee construction, together with Varna firm LAGIS Ltd.
M-Y-S also designed Mall of Sofia, which opened last year, while former Mall of Sofia chief executive Eli Egosi will act as consultant on the project. Real estate consultants Colliers International will handle all leasing contracts in the complex. The project has been recognised as a first-class investment by the country's investment agency BAI, which entitles it to certain tax breaks and state aid.